Sometimes the biggest impact of a trade isn't what the newly acquired player himself does, but how he affects those he plays with. The return of Erik Cole to Carolina from Edmonton at the trade deadline already has done won for Hurricanes center Eric Staal. Staal was having a good season without Cole, who was dealt to the Oilers last summer for defenseman Joni Pitkanen. But he's been on fire since Cole's return Wednesday. Staal had a pair of assists Friday night, when the Hurricanes blew out Calgary, 6-1. But that was just a warm-up for what he did Saturday night. Staal became the second player (Dainius Zubrus, 11/23/08) in the NHL this season to score 4 goals in a game and the first to get 6 points as the Hurricanes routed Tampa Bay, 9-3. Cole assisted on two of Staal's goals, and both had assists on tallies by Joe Corvo and Tuomo Ruutu. Staal takes a five-game point streak into the new week, and has 12 points during that span. Carolina will need its No. 1 center to keep lighting up the scoreboard in order to nail down one of the final playoff berths in the Eastern Conference. Sean Bergenheim -- The New York Islanders have waited a long time for their 2002 first-round pick to deliver. Maybe it's happening now. Bergenheim had his first NHL hat trick last week in a rout of New Jersey Saturday, and has 7 goals in his last eight games. 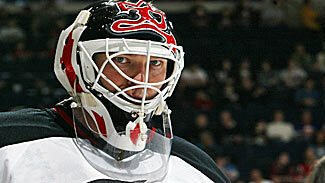 Martin Brodeur missed 50 games with a biceps injury that required surgery. If his first three games back are any indication, he hasn't lost a thing. Marc-Andre Fleury -- Fleury's performance has been a key to the winning streak that has carried the Pittsburgh Penguins back into the top eight in the Eastern Conference. He's won his last six decisions, allowing just 10 goals in the six wins. Jarome Iginla -- Calgary's captain continues to put up the points. He extended his point streak to eight games by scoring in each of the Flames' four games last week and reached the 30-goal mark again by scoring on Sunday at Atlanta. Roberto Luongo -- His groin is fine, and so is his game. Luongo has won his last four starts for the surging Vancouver Canucks, and his record for the season is up to 23-8-5 thanks to 12 victories in his last 13 starts. Rick Nash -- Nash's offense is a big part of the Blue Jackets' push for their first playoff berth. He surpassed the 30-goal mark again by scoring three unassisted goals in the Blue Jackets' 8-2 win at Detroit on Saturday. Dustin Penner -- Penner is big, fast and skilled, but he hasn't been very productive for a while. Penner has gone without a point in Edmonton's last nine games and is on pace to finish with fewer than 20 goals for the first time in his three full NHL seasons. Kyle Wellwood -- Wellwood has disappeared since the start of the new year. The slick center only has 2 assists in Vancouver's last 20 games and has seen his ice time cut as his production drops. Brian Boucher -- With Evgeni Nabokov injured, San Jose turned to Boucher, who lost all three of his decisions and allowed 11 goals in the Sharks' worst week of the season. He'll also be remembered for allowing Marek Zidlicky's 95-foot bouncer to hope through his pads Thursday. Blake Wheeler -- Has Wheeler, one of the NHL's most impressive rookies, hit the wall? He hasn't registered a point in his last four games, hasn't scored a goal since Feb. 17 and was a healthy scratch Saturday. Brent Seabrook -- Seabrook is among the Blackhawks whose offensive production has disappeared. Despite averaging more than 22 minutes a game over the last nine, he hasn't put up a point. He also went minus-3 in the Blackhawks' weekend losses to Boston and Colorado. Injuries, news and notes -- Gary Roberts' career may be coming to an end. Roberts was placed on waivers by Tampa Bay last week, was unclaimed, and was given a few "personal days" by Lightning GM Brian Lawton. He said he will meet with Roberts this week to discuss his future. Out -- Toronto's Vesa Toskala has been shut down for the season and will undergo hip and groin surgery. He's expected to be ready for training camp in the fall. The Leafs also lost two defensemen, Mike Van Ryn and Jonas Frogren, with lower-body injuries in the first period Saturday, after Tomas Kaberle left Tuesday's game with an injured right hand, the same one he broke earlier in the season. … Philadelphia center Daniel Briere's comeback from groin and abdominal problems didn't last long. He re-injured himself Thursday, though he hopes to be back in the lineup this week. … San Jose goaltender Evgeni Nabokov, who missed a couple of games with the flu, has missed a couple more with what the team called a lower-body injury sustained at practice Wednesday. He could be back this week. … Detroit defenseman Andres Lilja is out indefinitely with a concussion, while forward Marian Hossa left Tuesday's game at St. Louis after crashing headfirst into the end boards. He injured his right knee in the process. He sat out games Wednesday at Colorado and Saturday against Columbus, but hopes to play this week. … Injury-riddled Calgary lost another forward when Todd Bertuzzi had arthroscopic knee surgery last week. He's expected to miss a month. … Ottawa defenseman Alexandre Picard could miss the rest of the season due to a knee injury. He's been placed on IR. Another defenseman, Jason Smith, left Saturday's game midway through the first period with a lower-body injury and did not return. … Colorado defenseman Cody McLeod injured his left shoulder Wednesday and missed Sunday's game. He's out indefinitely. … Islanders forward Trent Hunter will miss the rest of the season with a fractured ankle sustained Saturday. Returning -- Sidney Crosby gave the Penguins a boost with a goal in his first game back Thursday, after missing four games with a groin problem. … Buffalo got a boost from the return of forward Thomas Vanek, who played Wednesday after missing nine games with a broken jaw. Forward Maxim Afinogenov, who went down with a groin injury Jan. 3, also returned Wednesday. … Minnesota defenseman Kurtis Foster played his first NHL game in nearly a year Saturday against Los Angeles when he was a late replacement for Brent Burns, who has the flu. Foster suffered a badly broken leg last March 19 at San Jose. He had been with the Wild for a few days after a six-game conditioning stint in the AHL. … Nashville forward Martin Erat returned Thursday after missing two games with a groin injury. … Dallas forward Landon Wilson, out since Jan. 3 with a rib injury, could return this week. … Detroit forward Tomas Holmstrom, who had surgery to repair a sports hernia Feb. 11, hopes to be back this week. … Toronto defenseman Jeff Finger returned Tuesday after missing three games with an arm injury. … Montreal center Alex Tanguay returned to the lineup Friday for the first time since Dec. 30, when he went down with a separated shoulder. … Columbus defenseman Rostislav Klesla played Saturday after missing three weeks with a separated shoulder. Still out -- Florida forward Rostislav Olesz took part in the morning skate before Thursday's game against Pittsburgh, the first time he'd skated with his teammates since undergoing surgery to repair a sports hernia Jan. 28. He's still not ready to play. … Chicago goaltender Nikolai Khabibulin has been skating at practice but isn't likely to return from his lower-body injury until next week at the earliest. … Calgary's Daymond Langkow still can't play because of a bruised hand. He's missed nine games. Flames defenseman Mark Giordano may not play again this season after undergoing shoulder surgery. … Washington defenseman Brian Pothier, sidelined for 14 months with severe post-concussion syndrome, was sent to the minors for a rehab stint. … Center Samuel Pahlsson, acquired by Chicago from Anaheim at the trade deadline, still is not ready to play. He's been out since Jan. 31 due to mononucleosis. … Another Deadline Day acquisition, forward Jason Williams, remains a week or two away from playing for his new team, the Los Angeles Kings. He's been out with a broken hand and says he's a couple of weeks away from returning. … Tampa Bay defensemen Paul Ranger and Andrej Meszaros both underwent successful surgery to repair torn shoulder labrums Wednesday. They are expected to be ready to go for training camp. The week ahead -- If you like lots of games, this is the week for you. Half of the NHL -- 15 teams -- play four times in the next seven days. Another 14 play three games and only one team (Anaheim) has a two-game week. New York Rangers at Carolina (March 9, 7 p.m. ET, VERSUS, TSN2) -- Surprisingly, it's the Rangers' first trip to the RBC Center this season. Versus will be on hand for this key battle between two Eastern Conference playoff contenders. The winner stays among the conference's top eight; the loser drops out. San Jose at Minnesota (March 10) -- The Wild make a pit stop at home for a rematch with the Sharks, a team they beat 4-3 in overtime five days earlier during a just-completed six-game trip. Calgary at Detroit (March 12) -- The second week of the Flames' road trip brings them to Joe Louis Arena for a battle between the leaders of the Northwest and Central divisions, highlighting a 13-game night. New Jersey at Montreal (March 14, 7 p.m. ET, CBC, RDS) -- The Canadiens continue their year-long centennial celebration by wearing replicas of the sweaters they wore in 1945-46 as they welcome Montreal native Martin Brodeur and the Devils. Philadelphia at New York Rangers (March 15, 12:30 p.m. ET, NBC, TSN) -- NBC will be back at Madison Square Garden again for the back end of a home-and-home weekend series. The last time these teams met on national TV, Feb. 15, the Flyers took a 5-2 decision. Carolina Hurricanes -- The Hurricanes start the week with a big home game against the Rangers, then visit Chicago, Dallas and Washington. By the time they finish with the Caps on Saturday, they'll have played four games in six nights and six in nine. Minnesota Wild -- The Wild come home from a six-game trip through Western Canada and California for a game against San Jose -- then head right back out for games at Colorado, Dallas and St. Louis, all in a six-day stretch. New York Islanders -- It's time for the Isles' annual March trip, and this week they're on the road for four games in six days -- all against Original Six teams. The Islanders start in Toronto on Tuesday and make stops in Montreal and Boston before ending in Chicago on Sunday afternoon. Anaheim Ducks -- The Ducks, who have played more games than any of their Western Conference playoff rivals, will do a lot of sitting and watching this week. They are the only team to play only twice -- and both games are at home. Chicago Blackhawks -- Chicago also gets to spend the week at home, with games against Carolina and Columbus, followed by a Sunday afternoon visit from the last-place New York Islanders. Montreal Canadiens -- After a weekend spent visiting Atlanta and Dallas, the Habs have a week at home, with games against Edmonton, the Islanders and New Jersey -- and no back-to-backs.